How to make a RACI Matrix? Are you looking for a professional RACI matrix template? Download this RACI Template as Excel Matrix now. 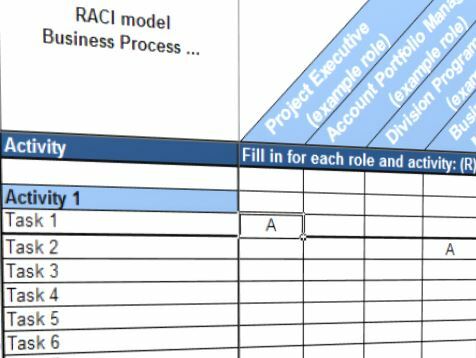 We provide a professional Excel Template for you to make a RACI matrix, also known as: 'Responsibility assignment matrix'. Accountable (also known as Final Approving Authority or Approver): There can only be one person who is ultimately accountable for the correct and thorough completion of each task or deliverable. The Accountable is the person who must sign off (Approve) on the work that the Responsible provides. Therefore, the Responsible is accountable to him/her. Print out your RACI template now! Fast, safe and easy! Guest: Many thanks for the Excel template. I thought I would never find one available in XLS format. Guest: Finally somebody took the time to create a complete Raci Excel Template. Many thanks! Guest: Very good Raci template. Helped me a lot! What is a Responsibility Matrix? The perfect tool to assign Roles and Responsibilities and improve your Business Process instantly.